Bleacher Report, the popular site for sports fans now boasting 22 million uniques per month, just released its Team Stream app for the iPad. Similar to Team Stream for iPhone and Android smartphones, the new Team Stream HD app features news and analysis and supports push notifications for breaking news. This is the first tablet-optimized experience from the company, but it’s not the only one: the company is also pushing out an iPad-optimized HTML5 browsing experience, too. 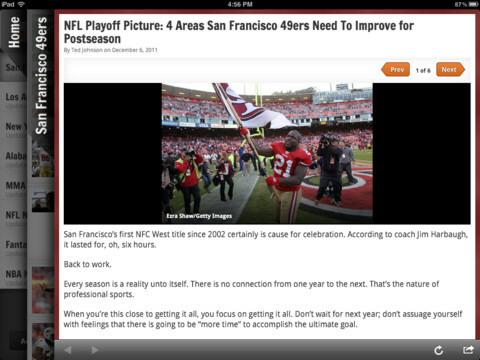 Now when iPad users visit www.BleacherReport.com, they’ll be directed to a tablet-friendly version of the website with enhanced navigation, full-screen photo viewing and special transition effects in between stories. The site will also support sharing and commenting on its editorial pieces. Meanwhile, the Team Stream HD app offers a personalized dashboard on the homescreen, with the headlines, top stories and tweets from the teams and topics you’ve deemed your favorites. As on mobile, you’re able to select which teams, athletes and sportswriters you want to follow, including athletes from the NFL, College Football, MLB, NBA, NHL, College Basketball Tips, Soccer, Tennis, Golf, MMA, Boxing, WWE and NASCAR. The new app is nicely laid out, too, with a bit of extra space in between the stories and an easy-to-use UI (user interface). BleacherReport, which just raised another $22 million this past summer, now includes an editorial team of more than 1,000 featured columnists and 6,000 contributors. Over 1.5 million users subscribe to its personalized email newsletters. And its content is now syndicated to national and regional publishers including USA Today, L.A. Times, Philly.com, San Francisco Chronicle, Houston Chronicle, and Seattle PI. To grab the new BleacherReport iPad app, head to iTunes here.